“Sixty-seven coal cars. Linefork unfolds in a mind-numbing sequence of 67 railroad coal cars clattering down the track hauling Kentucky’s strip-mined coal out of the Appalachian mountains. That opening scene plays out for frozen minutes that could represent one of the most repetitive and boring cinematic preludes ever screened—and yet is actually one of the most effective film openings imaginable. The viewer is magically lulled and lured into the time sense of Letcher County, Kentucky, a quotidian pace far removed from the headlong rush of twenty-first century life. The cinematography sings of truth; a narrative of community strung along the banks of Line Fork, a meandering branch of the North Fork of the Kentucky River that winds past the ancient Lilley Cornett Woods to the high mountains of Kingdom Come. 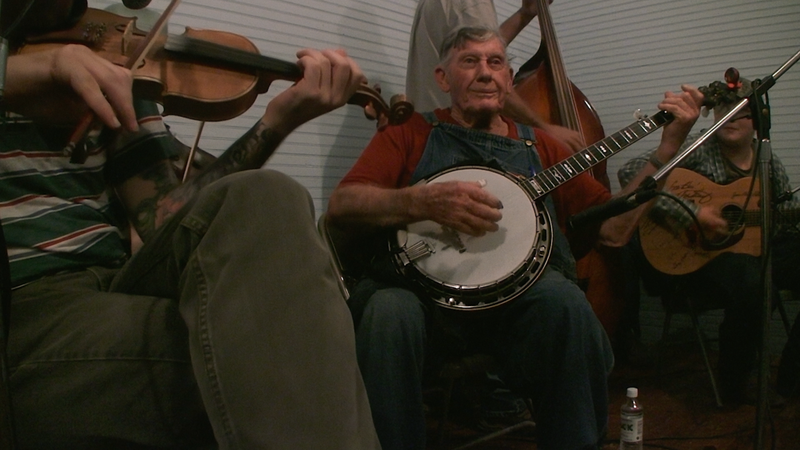 Coal miner and banjo master, Lee “Boy” Sexton and his wife Opal Sexton are the lens through which this story is revealed. The relationship of land and people bound together by tradition and culture is documented in the intensely intimate portrait of daily life lived at the homeplace, in the garden and kitchen, and among neighbors. The soundtrack unflinchingly presents the contrasts of exquisite moments of banjo against a blaring television set, of discordant conversation against sylvan solitude. The unblinking eye of the camera records the seemingly insignificant details of life in a special way that elevates the inconsequential to the sublime. Linefork is art that eschews art in favor of hyper reality.